Fly reels are pretty boring things. Generally, they sit around and "just hold line." Oh, sure, you'll notice them when you pull out line from the reel to cast. But, by and large, they just sit there not doing much of anything. Yet, that all changes the minute a big fish tags onto your fly. At that moment, the fly reel becomes one of the most important pieces of equipment. Under stress - such as when a big fish is yanking out yards of line every second - a poor quality fly reel will show its true colors, leading to lost fish and potentially damaged or broken equipment. For this reason, it makes good sense to get a good fly reel right out of the gate - instead of deciding to get a good reel after watching a huge fish disappear into the river due to fly reel failure. To help anglers venturing to Montana to get the right fly reel for their needs, I've prepared a short buyers article about it. If you want to skip all this reading, I've listed the essence below. For general all-around use, both fly reel drag mechanisms work well. However, disc-drag fly reels are far more common. 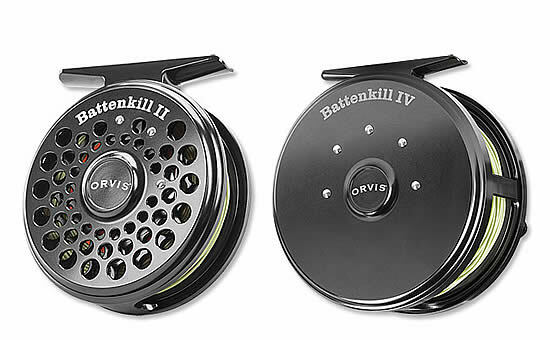 That said, my recommended Orvis Battenkill reel is a disc drag system. Weather resistant. Your fly reel will get wet. Make sure that the reel is rust-proof (made of non-rusting components). Fly Reels that cost less than $30 are generally cheaply made inside. The drag is uneven and they break down quickly. Spend just a bit more more and you'll have a fly reel that can last decades. Get a single retrieve fly reel (the most common). Don't get an automatic or multiplying retrieve, which are nice for saltwater fishing but not for freshwater fly fishing. Make sure, repeat, make sure that you match up the fly line weight with the fly reel weight. Thus, if you have a 4-weight floating line, you want to get a fly reel designed for 4-wt line. And then match that with a 4-weight fly rod. Order a spare spool when you order the fly reel. You will want the spare spool sooner or later, and most likely, by the time you want it the type of spool you need will no longer be sold. If you want one fly reel recommendation, go with an Orvis Battenkill. I have a Battenkill, it's nearly 20 years old, and still works as good as the day I bought it. These reels are are sold at Amazon, Fishwest, The Rivers Edge, and Orvis retail stores. Fly reels have two different types of drag systems - the disc-drag and the spring-and-pawl. Both are excellent drag systems, but the "spring and pawl" type is now rather difficult to find, as "disc-drag" fly reels have become increasingly popular. The "spring-and-pawl" drag system is the original drag system and is still as good as the day it was invented. This type of drag system uses gearing inside the fly reel to allow the fly line to exit the fly reel at a very steady and uniform rate. This type of drag system is excellent for trout and other smaller fish. By contrast, the disc-drag system works similar to that of the braking on a car. A pad inside the fly reel can be adjusted, putting less or more tension against the fly line. In this way, the drag of a disc-drag fly reel can be adjusted to almost infinite levels. When disc-drag fly reels came out years ago, the "jerkiness" of how the line left the fly reel was stuff of legends. Today, however, virtually all fly reels have at least halfway decent disc-drags in them. 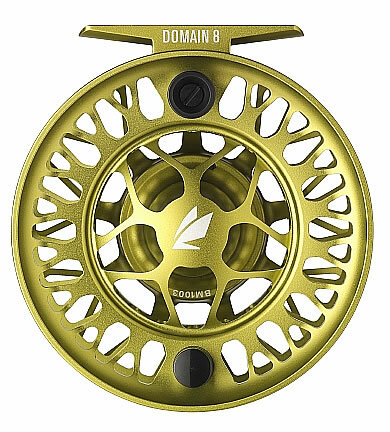 And many of the top fly reels have disc-drag systems that exceed the spring-and-pawl systems in how they allow the fly line to leave the fly reel in a smooth motion. By and large, if you are a new angler, it really doesn't matter which drag system you choose. Long as you buy a quality fly reel, the drag systems should perform nearly equally. Their are three types of retrieval systems in a fly reel - the single action, the multiplying fly reel and the automatic fly reel. A multiplying fly reel retrieval system allows line to be brought back onto the fly reel significantly faster. This is accomplished through a confusing network of gears that allow one turn of the fly reel handle to equal 2 or more turns of the spool (the spool holds the line). While this seems nice at first blush, truthfully, these fly reels can be kind of a pain - at least for fishing in rivers. Automatic fly reels have a well-deserved reputation as being temperamental, awkward to use at times and make it needlessly difficult to change spools (say, to go from floating fly line on one spool to sinking fly line on the other spool). For standard fly fishing in rivers for trout, bass and similar sized fish, stay away from multiplying fly reels. By and large, multiplying fly reels are used for saltwater fishing and deep-lake fishing. The third type of fly reel retrieve system, the automatic fly reel retrieve, does just what the name suggests. The reel retrieves all fly line without the angler turning the spool at all. The fly reel, instead of having a spool which is then turned by a handle, instead has a trigger. When released, the trigger allows the fly line to zip back into the reel. This isn't needed, or actually wanted, when fly fishing for most freshwater fish - particularly when fishing on rivers. But can have uses if you are fly fishing in huge lakes or in saltwater. When shopping around for a fly reel, anglers will not need to spend a fortune. However, anglers should stay away from the $30 and less fly reels. These reels frequently fall apart over time, have jerkiness in their drag systems and often start to rust. For beginner and intermediate anglers, a fly reel in the $80-$150 range is probably the sweet spot. When you purchase the fly reel, be sure to buy an extra spool at the same time. Like most things in life, fly reel models come and go quite frequently. If you wait too long to buy a spare spool, most likely it will no longer be made or sold. This is one good reason to buy a Orvis Battenkill Reel....these reels have been around forever and Orvis seems to be in no hurry to discontinue them, either. Many manufacturers produce quality fly reels. Quality fly reels are made by Orvis, Cabela's, Sage, Redington & Ross...among many others. But again, stay away from the "entry" level fly reels. Spend a bit more and get a good quality fly reel that will last more than a season or two. Offline, any quality fly shop should have a good selection of quality fly reels. Just stay away from buying a fly reel at a big box store (which is where the junkiest reels are found). Orvis Fly Reels at Amazon - Orvis has an excellent selection of fly reels for all budgets. If in doubt about which reel to get, go with the Battenkill. Other Quality Fly Reels at Fishwest - Fishwest has a great selection of high quality fly reels at excellent prices. Cabela's - Cabela's sells both their own brand of quality reels, along with brands from Sage, Redington, Hardy and others. Trout's Fly Fishing - High-quality trout shop in Denver with a great online store. Sells reels from Orvis, Ross, Sage, Bozeman Reel and several hard to find fly reel models. The Rivers Edge - A local Montana fly shop in Bozeman that has a nice online store and sells Orvis and other quality fly reels. Front Range Angler - Sells high quality fly reels. Located in Colorado. Vail Valley Anglers - Based in Vail, this quality fly shop has a wide selection of fly reels from Orvis, Ross, Hatch, Abel and many others.